Lizzy Dishes Portland: I'm leaving on a jet plane, with tears falling. Portland's literary events are SHINING right now. And I can't go to any of it! No, this is not all about me. That would be called PERMANENT insanity. 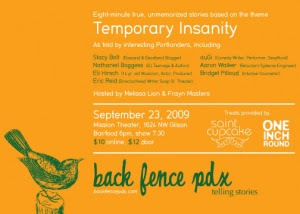 Stories about temporary insanity from lots of people, including a pet psychic and a 14-year old musician! Also free cupcakes from Saint Cupcake. Tickets are $10 in advance, $12 at the door. At the Mission Theater. GO. Thursday night: Wally Lamb at Portland Arts and Lectures. I love this series. Like I'm in love with it. It's so insightful to hear these writers read and talk about their work. Because don't you want to hear them read their own words in their own voice? And answer your questions? Of course you do. GO. Because if I had all the money in the world and all the time in the world. I would spend all of it on Write Around Portland. Writing and community get married and breed well at Write Around Portland. Don't you want to be a part of that? I'm absolutely the most sad about missing this event. Last year I was in Wordstock, organizing emcees. And I loved it. I loved all the people I worked with - good people. And smart. And they put in literally hundreds and hundreds of hours to pull this off. Mostly volunteering! This year, they have a focus on food. Which is one of the reasons I am so sad. Because, you know, I love food. Portland! Go to these events! Give them your money! Keep these events going! You will get smarter. I promise. R U sayin' I'm dum?